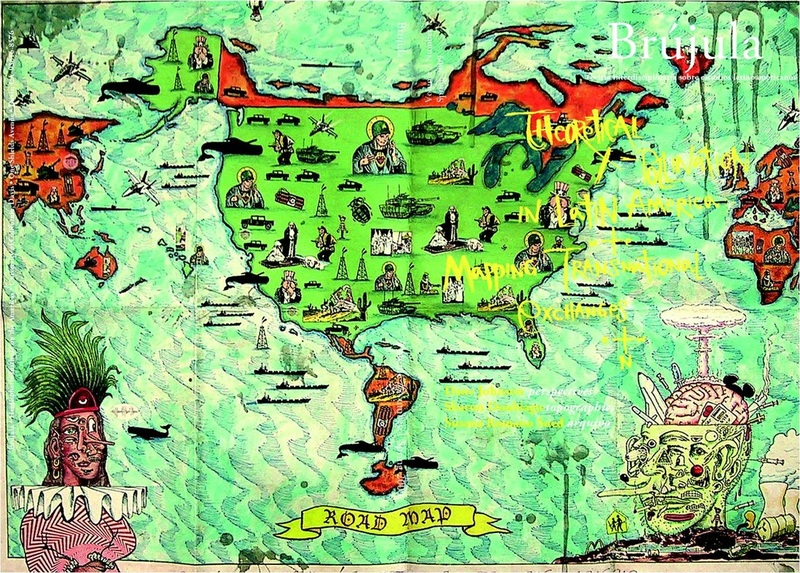 The seventh issue of Brújula focuses on the inherently transnational and multilingual nature not only of Latin American art and culture, but also of the frames of knowledge and theories that define Latin America as a field— be they “misplaced,” “pluritopic,” “dependent,” “hybrid,” “diasporic,” or “traveling” theories.The literary, aesthetic, and cultural works of this volume explore ways in which Latin America and the rest of the world interact through theoretical comparisons, influences, exchanges, intersections, and resistances. As guest editors of this issue, and as students of Comparative Literature, we are deeply interested in the opportunities for comparison and intellectual collaboration that these interactions offer. The very name Latinoamérica offers the possibility of mapping a historical trajectory of the political debates that surround the discipline. At stake in the differing naming of the spaces referred to as ‘Latin America’ is the inclusion of French-speaking territories (French included here as another language that derived from Latin). At stake here, also, is the claim of French literature departments to the literary productions of these territories. Other options, such as Iberoamérica or Hispanoamérica circumscribe the relation to Portugal and Spain, and to an earlier model of colonial relations. In any of these cases, the spaces to which these names are pointing stand in a relation to another (European) space. This relation tends to be conceptualized as a hierarchical relation in which the ‘—american’ space occupies a peripheral position. These designations reflect an inherently “international” relationship, a former colonial inflection translated to the academic stage. We would like to offer our great thanks to all of those who contributed to this volume in order to ensure its completion. Thank you to the Hemispheric Institute on the Americas(HIA), the Departments of Comparative Literature and Spanish and Portuguese at UC Davis, and the Graduate Student Association (GSA) for their generous support of this project. We would also like to extend our gratitude to the magnanimous Dane Johnson, Sharon Doubiago, Susana Romano Sued, Robert Irwin, Christina Siracusa and Enrique Chagoya for their time and extensive dedication. Permission to use this image, as well as those in the Arte Factu section, was very generously granted by the artist. We would also like to offer a special thank you to the Gallery Paule Anglim for its generosity and assistance. Thanks to the following contributors to Brújula Volume 7. Belén Bistué received a doctoral degree in Comparative Literature from the University of California, Davis, in December 2009. Her essay “The Task(s) of the Translator(s): Multiplicity as Problem in European Renaissance Thought” won the 2009-2010 A. Owen Aldridge Prize, from the American Comparative Literature Association and the journalComparative Literature Studies. She is currently working at the Universidad Nacional de Cuyo, in Mendoza, Argentina, as a researcher for CONICET (the Argentine National Council for Scientific and Technological Investigation), and her current project focuses on the practice of collaborative translation and the production of multilingual editions during the Spanish American conquest and colonial period. Suzanne Bost (Ph.D., Vanderbilt) is an Associate Professor of English at Loyola University in Chicago. Her new book, Encarnación: Illness and BodyPolitics in Chicana Feminist Literature, analyzes the function of pain, illness, and disability in the writings of Cherrie Moraga, Gloria Anzaldúa, and Ana Castillo. She has also published Mulattas and Mestizas: Representing Mixed Identities in the Americas, 1850-2000 and a number of articles featured in Aztlán, African American Review, MELUS, Postmodern Culture, Nepantla,and Mississippi Quarterly. Brian Davisson is a Ph.D. candidate in Comparative Literature at the University of California, Davis. His research includes studies on exile, nationalism and historicism in the context of Spanish, Latin American and German literature. He has forthcoming articles on the mediation of nationalism in the exile of Max Aub, and on the historicization of dictatorship in the writings of Miguel Ángel Asturias. Shawn Doubiago recently completed her Ph.D. in Comparative Literature with two designated emphases in Feminist Theory and Research and Critical Theory at UC Davis. Her dissertation entitled, Writing Wrongs: Representation and Transformation in 20th Century Women’s Writing on War and Conflict, focuses on the writings of Elsa Morante, Irène Némivrosky, and Assia Djebar. She is currently teaching Comparative Literature, Philosophy, and Film at USF and BCC. She has begun working on a book project entitled,The City at War: Reflections on Violence in Urban Spaces, in collaboration with Susanne Hoelsher from USF. Gail Finney was educated at Princeton University and the University of California, Berkeley. She taught formerly at Harvard University and is currently Professor of Comparative Literature and Chair of German and Russian at the University of California, Davis. Her publications include: The Counterfeit Idyll: The Garden Ideal and Social Reality in Nineteenth-Century Fiction, Women in Modern Drama: Freud, Feminism, European Theater at the Turn of the Century, and Look Who’s Laughing: Gender and Comedy (editor), and Visual Culture in Twentieth-Century Germany: Text as Spectacle(editor). She has published numerous articles on 19th-and 20th-century German and comparative literature, and is currently writing a book entitled The Dark Side of the Screen: Family Trauma in Contemporary American Cinema. Claudia Francom is a Ph.D. candidate in the Department of Spanish and Portuguese at the University of Arizona. She holds an MA in Hispanic linguistics and her research includes theories of language in contact, sociolinguistics, language socialization, and intersections between history of the Mexican-American Border and visual cultures. Currently, her research focuses on language choice in service encounters among Latino communities. She also enjoys doing research on the Black Legend and its unfavorable consequences for the people, economy, and local dynamics surrounding the Mexican-American Border. Amy S. Gerald (Ph.D., University of North Carolina at Greensboro) is an Assistant Professor of English at Winthrop University. She directs the Winthrop Writing Project and teaches courses in rhetorical theory, composition theory and pedagogy, English education, and women’s literature. She has published in Feminist Teacher and participated on conference panels for CCCC, CEA, and NWSA. Timothy Gerhard is an Assistant Professor of French and Spanish at SUNY Cortland. His research focuses in Francophone Studies, with a special interest in music, film and teaching reading at the intermediate level. His recent article “At the Edge of the Abyss: A Case for Teaching Race and National Identity in Victor Hugo’s Bug-Jargal” was accepted for publication by EAPSU Online. He has presented on topics related to Mexican and Chicano literature and the use of Chicano literary texts and songs in the language classroom. His first published article, “Unsettling Experiences: Transnational Dialogues of Necessity in Journal, Nationalité: immigré(e) and Paletitas de guayaba” (in Wagadu: A Journal of Transnational Women’s & Gender Studies) is available at:http://appweb.cortland.edu/ojs/index.php/Wagadu/issue/view/27. Maryam Monalisa Gharavi is a Ph.D. candidate in Comparative Literature and Film & Visual Studies at Harvard University. Her fields of study include discourses of progress and modernity and the political terrain of empire, especially in the global South. She is a published poet and has directed several films. Currently she is a Graduate Student Associate at the David Rockefeller Center for Latin American Studies. Her dissertation compares transgression and banditry in cinema during Brazil’s military dictatorship and liberal democracy. She is translating Algaravias by Syrian-Brazilian poet Waly Salomão. Antonio Gómez received his Ph.D. in Latin American literature from the University of Pittsburgh, and currently teaches Latin American Literature and Film at Tulane University. His research interests include the discourse of exile in Latin American intellectual history, documentary film and the writing of recent history—especially the present rewriting of the sixties, and new cinematic poetics in Latin America. He has edited the volume Provisoria-mente. Textos para Diamela Eltit (Beatriz Viterbo, 2007), and is currently working on a book project on filmic renarrations of Argentine history of the 60s and 70s, in collaboration with Verónica Garibotto. Their coauthored article “‘Releo mis papeles del pasado para escribir mi romance del porvenir’: Respiración artificial y el programa de refundación del campo cultural argentino” is forthcoming inRevista Iberoamericana. Mela Jones Heestand is a Ph.D. candidate in the department of Comparative Literature at the University of California, Davis, whose dissertation is entitled The Spaces of Memory in the French Caribbean and the Indigenous Andean Novel. Her focus is post-colonial literature of the Andean region with an emphasis on indigenous literature. She is interested in representations of Andean indigeneity, indigenous oral culture and poetry and prose written in the Quechua language. Diana Lysinger is a Ph.D. candidate at UC Davis and Adjunct Professor of German and Russian at American River College, CA. Bachelor’s degree in Education with a teaching major in Foreign Language Instruction (German). Received the following awards, among others: the Socrates Erasmus fellowship for study in Heidelberg (Germany) and the Outstanding Graduate Student Teaching Award for excellence in teaching. Research focus on Cognitive Grammar and linguistic text analysis. Emiro F. Martínez-Osorio received his Ph.D. from the University of Texas at Austin. He is Assistant Professor of Spanish at Sewanee: The University of the South. His research interests include epic poetry, captivity tales, piracy, and Colonial Latin American literature. He is currently working on a monograph on the relationship between Juan de Castellanos’ Elegías de varones ilustres de las Indias and Alonso de Ercilla’s La Araucana. Kathleen McEvoy (Ph.D., University of North Carolina at Greensboro) is an associate professor of English and Gender & Women’s Studies at Washington & Jefferson College in Washington, Pennsylvania. She holds a Ph.D. in Rhetoric and Composition with minors in American Literature and Gender & Language Studies. Moisés Park was raised in Bolivia, Brazil and Chile. He is a Ph.D. candidate in Spanish at UC Davis, and his dissertation revolves around the themes of generational conflicts, desire, spectacle and memories in postdictatorial Chilean literature and films. Moises is also working on a side project on orientalism in Chilean martial arts films. He plans to teach and make films after writing his dissertation. His other areas of interests include critical theory, (pop) cultural studies, and music. Isabel Porras is a third-year Ph.D. student in the Cultural Studies Graduate group at UC Davis and a member of the estudios culturales en las americas research cluster. Her research interests include hemispheric subjectivities and epistemologies of race. Daphne Potts is a Ph.D. candidate in Comparative Literature at UC Davis. Her dissertation entitled, Placing and Displacing Cartographic Narratives: The Politicization of African Spaces in Literary and Filmic Representations of Africa, investigates the spaces and cartographies generated through representations of Africa in African literature and African, French and American film. She is focusing particularly on the shifting politicized spaces that arise in the colonial, postcolonial and contemporary moments and their subsequent trajectories. Susana Romano Sued es profesora de Estética y Crítica Literaria Moderna en la Universidad Nacional de Córdoba, Argentina e Investigadora Principal en el Consejo Nacional de Investigaciones Científicas y Tecnológicas-CONICET. Se ha desempeñado como profesora visitante en universidades de Europa, EEUU, Canadá y Sudamérica. Sus áreas de investigación incluyen las relaciones de la ciencia y la cultura con el pasado histórico, la importación de discursos y las intersecciones interdiscursivas de las disciplinas, así como el papel de la memoria y sus registros en la literatura y en la teoría en Sudamérica y en países europeos. Tiene publicada una amplia obra poética y ensayística, lo mismo que traducciones de textos teóricos y literarios en alemán, inglés, francés, italiano y portugués. En el 2007, recibió el Premio Lucien Freud de Ensayo y elPremio Bernardo Houssay al Investigador Consolidado. Su dirección en Internet eswww.susanaromanosued.com. Elizabeth Russ (Ph.D., Columbia University) is an Assistant Professor of Spanish and Latin American Literature at Southern Methodist University. Her forthcoming book, The Plantation in the Postslavery Imagination of the Americas examines the persistence of the plantation in trans-American literatures by analyzing differences between male and female-centered discourses, modern and postmodern imaginaries, and U.S. and Spanish American notions of nation. She has also published articles in Mississippi Quarterly, Revista de Estudios Hispánicos, and Latin American Literary Review. Anne Salo is the recent recipient of a Ph.D. in Comparative Literature from UC Davis. Her research interests center on the politics and literature of late-medieval Spain and England, but also extend to theories about reception, transmission and translation. She is currently working on a project about Fernando de Rojas’ Celestina. Kristin L. Squint received her Ph.D. in comparative literature from Louisiana State University in 2008 and has taught English at Southern University, Baton Rouge, since 2005. She is currently working on a book project that examines how Native spiritualities are represented as resisting Euro-American colonialism in novels by American Indians. She has previously published articles in Postcolonial Text and the CLA Journal and recently reviewed two books for Mississippi Quarterly. Shannon C. Stewart holds a Ph.D. from the University of North Carolina at Greensboro and serves as an Assistant Professor of English at Coastal Carolina University in South Carolina. She teaches a variety of writing and world literature courses and is currently researching the rhetoric of roller derby. Pam Whitfield (Ph.D., University of North Carolina at Greensboro) teaches English, Women’s Studies, and Equine Science courses at Rochester Community and Technical College in Minnesota, where she also directs the writing area of the Comprehensive Learning Center. Her work has appeared in academic journals, equestrian websites and magazines, and publications in China and Hong Kong.